Writers Immersion and Cultural Exchange (WrICE) is a program of reciprocal cultural exchange focused on writers and writing, ran by the non/fictionLab at RMIT University, in conjunction with the Copyright Agency. The program brings together a group of five Australian and five Asian writers each year for a face-to-face collaborative residency in Asia followed by a reciprocal event in Australia at the Melbourne Writers Festival. It contributes to an Asia-Pacific community of writers, sparking networks and connections and raising the professional profile of writers across the region, building and nurturing connections between Australian and Asian writers and writing. 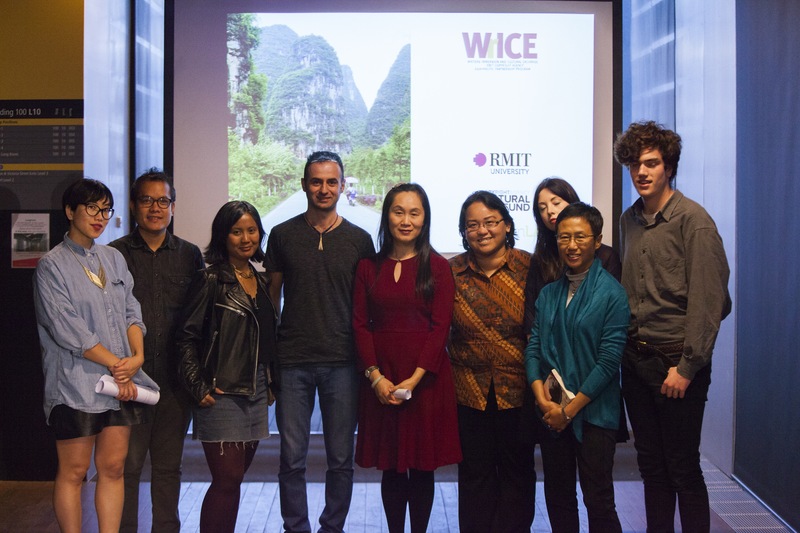 In 2016 the WrICE China collaborative residency took place in Yangshuo, China, with corresponding public events, including a panel discussion, readings and workshops at Sun Yat-sen University in Guangzhou. In 2016 the program brought together the following writers and fellows from Australia and Asia: Peter Clynes (current student of creative writing and Mandarin at RMIT), Fan Dai (Chinese writer and professor of English in the Department of English, School of Foreign Languages, Sun Yat-sen University), Eliza Vitri Handayani (novelist from Indonesia), Michele Lee (Asian-Australian playwright and author who works across stage and audio), Alice Pung (award-winning writer, journalist and essayist -one of Sydney Morning Herald’s Young Novelists of the Year 2015), Mary Rokonadravu (winner of the 2015 Commonwealth Short Story Prize for the Pacific region), Ara Sarafian (Melbourne-based writer and editor), Maggie Tiojakin (Indonesian writer, journalist and translator), Mia Wotherspoon (Melbourne-based writer and editor, currently completing her final year of RMIT’s Associate Degree in Professional Writing and Editing), Lawrence Lacambra Ypil (poet and essayist from Cebu, Philippines). At Yangshuo Eliza worked on “The Love Story of My Father and Me“, which was later published in BooksActually’s Gold Standard anthology, which consists of some of the most cutting-edge cult fiction in Asia today. At Sun Yat-sen University, Eliza participated in discussions and gave a writing workshop to students. In the second part of the WrICE program, Eliza and the other authors participated in public events at the Melbourne Writers Festival and other venues. At MWF Eliza spoke at the panels Muslim Feminism, Protest & Rebellion, and Writers Across Borders. She was also one of the surprise guests at Dumbo Feather‘s Caravan Conversation. At the launch The Near and the Far–a collection of previously unpublished pieces from WrICE alumni from across the Asia Pacific including Maxine Beneba Clarke, Cate Kennedy, Xu Xi, Alice Pung, and Omar Musa, among others–which took place at Present Tense, RMIT University, the authors read a short extract of their work. Eliza read from “The Love Story of My Father and Me“. The authors also did a mini-residency at Castlemaine, just outside of Melbourne. At the end of it, they performed a medley of reading at the Castlemaine Royal Theatre. Eliza read another excerpt from “The Love Story of My Father and Me“. “WrICE plucked me out of my solitude and put me among some of the most cutting-edge literary minds from Asia and Australia – for a week in Asia and another week in Australia. The format of the program allowed us plenty of time to get to know each other and to talk about the topics that concern us deeply, about our life and conditions for writing and publishing where we live. The intimate, immersive character of the program enabled exchanges that went deeper than the usual networking conversations amid the hustle and bustle of festivals and conferences. I believe the writers came away with meaningful insights, as I did, into what it means to live where the other writers live and write what they write. In turn we will communicate those insights to people back home through our works and conversations. If books change the world one reader at a time, then WrICE is doing miles towards improving relationships between Asia and Australia.